Today we were off as a family to Universal Studios and Islands of Adventure. Granny and Gramps stayed at the village and we would see them later. Universal Studios has 2 different parks you can NOT hop back and forth like DisneyWorld. I decided we'd do Islands of Adventure first since they had Seuss Landing and Hailey is a Dr. Seuss fan. Unfortunately there are NO rides that Hailey could have gone on so we saw every character we could and saw lots of shows. The day started off over cast which is great! As long as the hot sun isn't beating on you along with humidity it's fine. Overcast and humidity is easier to deal with. That sun is brutal. The Cat in the Hat. We were in a circle of all the Dr. Seuss characters so getting Hailey's attention was difficult. She didn't mind the Grinch. He was being silly the whole time. Here is Sam I am. These guys in the suit need props for melting away inside the costumes on such warm days. Hailey was lots of smiles today. Today she didn't mind wearing her sunglasses. I took a picture to remind me to look up this book. Never heard of it. We went into stores to cool off and there were so many fun things around it was hard to get Hailey to leave. My little sister and I are HUGE Harry Potter fans! My sister wanted so bad to go to The Wizarding World of Harry Potter with us. I made sure to take lots of pictures for her. 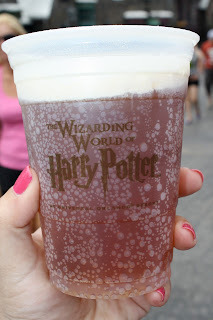 I had to try the famous Butterbeer I've been reading about for YEARS! It's very yummy. Tasted like ginger ale and butterscotch. Very creamy on top and $4 bucks a drink. It comes 2 ways, Cold or frozen. Funny thing about it is that it's not very cold and they don't give you straws unless you order the frozen kind? This is a store and a show in one. You go inside a dark wand shop and see the wands piled up from the floor to the ceiling! One child gets called upon to get to have a wand given to them. In our show a little boy was picked and the wands he'd pick would cause chaos in the store. It wasn't until his 3rd wand when he grabbed it and the light shined and the wind blew and a story behind the wand and how it was made was told. When everyone left they asked us to stay behind. Hailey was pretty freaked and crying so I held her. They did the whole show again but JUST for Hailey. We were the only ones there. Our own private wand ceremony! It was amazing! After she had the wand in her hands she was happy again! Have you ever wanted to see Hogwarts School up close! You got to go here! Loving her unicorn hair wand! Make your way through the hallways and corridors of Hogwarts castle. Dumbledore welcomes you as you visit his office on the way to the Dark Arts classroom. Harry, Ron, and Hermione meet you there and invite you to the Quidditch match instead of staying and listening to another boring lecture. You then board special “enchanted benches” which allow you to soar above the castle grounds. Be prepared because during your journey you may encounter dragons, spiders, the Whomping Willow, and dementors! Josh said he'd wait behind and be with Hailey while I went. That ride was indescribable! So awesome. I got off and told Josh he HAD to go on this ride and I couldn't explain why. He went and agreed how awesome it was! Favorite ride EVER!! Time to visit the island of Jurassic Park for lunch! We didn't get to go on the ride, but we went on the ride in California. It seemed like people were walking around like they had been dunked under water soaking wet. They had all just got done with the ride. Not a wet spot on the boat. Everyone gets soaked! Walking through the park we ran across a Sponge Bob Square Pants Parade and were joined by all the characters! High 5 for Sponge Bob. Patrick got in on a family picture! Well the sun ended up coming out and boiling us so we took a trip to Curious George's water play land. We took Hailey's shoes and socks off and had her wheelchair close to a water fountain. SHE LOVED IT!! She was laughing the whole time! After we played in the water we walked over to Song time with Barney! What a HIT this was! They sang LOTS of Hailey's favorite songs and Hailey and I sang along as loud as we could. I loved that I was able to do that with her. She LOVES music! We were invited to stay after for a private meet and greet with the big purple dinosaur and Hailey would not let us put her shoes back on! For the whole rest of the day my child wanted to go bare food. She really isn't ever given the oppertunity to go bare foot. She always has to wear those hard AFO's. She's suppose to wear them 12-15 hours a day, but since we are on her wish trip if she wants her shoes off then let them be off!! People must have thought I was either crazy or poor not putting shoes on my kid. Oh well! Frank the Pug from Men in Black! We got to stay after the show for a meet and greet with Frank. He was so friendly and so soft. One of our dogs is half pug and no where near as calm as Frank. We also stopped to get me a chocolate covered caramel apple and we had a few people notice that Hailey was here on her make a wish trip thanks to our buttons! So many wished us a good trip and one lady even passed on a gift card she was going to use to Hailey. By far Universal Studios and their staff far surpassed my expectations! Even though there wasn't a single ride Hailey could go on, they invited us to lots of private meet and greets, didn't allow us to stand in the sun or in line for anything. Every character was so gracious and came to us for pictures. They offered Hailey a private wand ceremony and gave her a wand of her own. Our experience at Universal was 10x's better then the experience at the Magic Kingdom. If I could tell a wish family one thing it would be to plan for a day at Universal where you can spend all day. The day we went they closed early for a private party and we only had 7 hours to do EVERYTHING and missed a LOT!